← Jenny Graham Update on her Unsupported round the World Cycle Record Attempt. 13086 miles in! Getting Ready for Winter – Up and away as daylight is getting shorter. Part 1 Planning, Torches, Maps and night wanders? This weekend I am off on the hill for a short day at last a day out away from the bike. The nights are getting darker, winter is coming and I was checking my torch, sadly it was not working after a dormant summer. This great summer has seen so many out travelling light and enjoying the hills in the magical weather. The shorter daylight of the onset of winter means shorter day on the hill or coming off in the dark. You will be reading in the media soon that a few will get caught out with no head-torches it happens every year. So when did you last check your torch and batteries? Get it out and check. It is also worth looking at your route and remembering that if you plan a 10 hour day you have the possiblilty of walking of in the dark. Get out early and make the most of the natural light. Walking at night is very different and worth practicing , have you done this yet. Its a good skill to have? You do not want to be on the tops in the dark unless you have to. Plan your day. What speed do you walk at night compared with the daytime. You may find a big difference? If you wear glasses on the hill its not easy to read a map in dark, I always expand my map by blowing up the scale on the computer . This is so that I can see the contours easily. My phone lets me do this as well and I have a screenshot ready in case I need it. 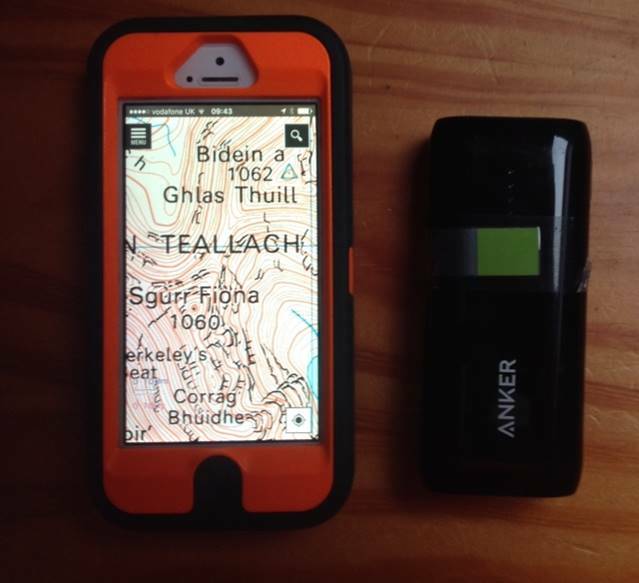 If using your phone have a spare battery and cable and always carry a map and compass. Phone spare battery and do not forget the cable. A few tips, but the nest advice is to get out and practise in the dark and this can be done anywhere. Far better to learn or check out your skills in a safe area than on the Ben in the dark in bad weather.  Your view without a torch on a dark night. From Tilly lamps to head – torches. It is hard to believe that on one of my early call outs in 1974 in March on Ben Nevis I was on a tragic search at night for a young couple who had wandered into 5 Finger Gully on Ben Nevis. I was given a tilly lamp to search with and was in the Gully when a then well-known Lochaber Team Member Willie Anderson who saw it took it off me as I was really struggling on the steep ground. Willie threw it away. I was worried about how I would explain that to my Team Leader? I have been there on several other occasions in 5 finger Gully and never found it and apologise for leaving litter on the hill. I wonder what future Mountaineering archaeologists will make of a Tilly in 5 finger gully. After that I purchased a decent head torch as the issue one was pretty poor. In Mountain Rescue you do a lot of Rescues and train at night a head torch is essential and there have been a few disasters on this piece of gear over the years. At RAF Valley in North Wales during a time when money was tight late 70’s MOD in its wisdom bought cheap batteries for our head torches that fell apart on a night rescue high on the Idwal Slabs. I was the Deputy Team Leader at the time and sent of a powerful signal to the powers that be about the procurement of such rubbish. That was the last signal I was to send for a time as it ruffled so many in the Supply Branch at the time but we got descent batteries after that. The marvellous improvement in head torches and lighting for personal and Rescue use is incredible. Tales of climbers climbing in a wild winter night with a torch in their teeth as they climbed some of the big routes in the ebbing light and moonlight are legend. After seeing the recent pictures of Cairngorm Mountain Rescue Team on call outs last winter with their powerful headlights is a huge improvement from the early days. Each rescuer is in their own world of snow and a pool of light it is surreal and impressive. I try to keep up with all the changes and the costs of some of these head torches are incredible some are over £300. I have tried so many the famous “Sharks Eye” with 6 heavy batteries that lasted about 2 hours was amazing but it was hand held and not much use when searching very steep ground. We also did some test with Hamish MacInnes and a huge Military Searchlight in Glencoe millions of Candle power how many remember that night? A head torch is a vital addition to a winter hill bag and I always carry a spare so often I have had to give mine away. This was often to some person who does not carry one or has not checked it for some time and the batteries are flat. Always check your head torch and ensure it is working. Try walking at night and see how tricky it is, imagine that without one? I always carry two after lending mine out on rescues and never seeing them again. Sadly your phone is NOT A HEAD TORCH. A few tips, check that torch, maybe buy a spare and batteries and have look at the map and your route, get away early and practice your skills no matter who or how experienced you are. 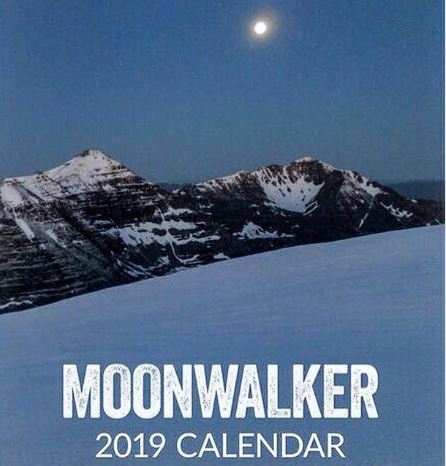 Here it is – the 2019 #Moonwalker calendar, still only £5 and ALL profits to Scottish Mountain Rescue. Walking at night is an incredible experience just read Munro Moonwalkers books.He has a great calendar out where all the profits go the Mountain Rescue its a great present for those who love the hills. This entry was posted in Gear, Mountain rescue, Mountaineering, Views Mountaineering, Weather. Bookmark the permalink.